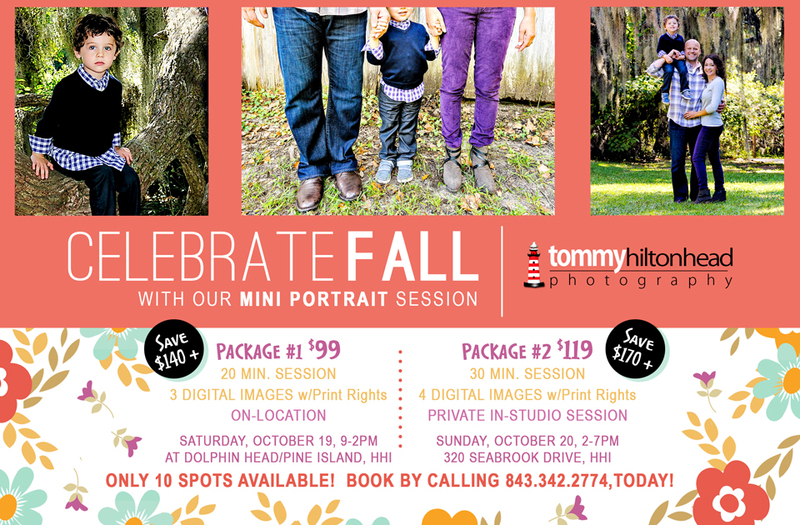 Our Annual FALL MINI SESSION is the perfert way to get hi-resolution Images so you can make your own beautiful photographs. And the best part is you also get the Print Rights —this way, you can print as many high quality photographs as you like! You see, at TommyHiltonHead Photography, we like to offer "specials" throughout the year at great savings to you. This particular offer combines Sitting Fees and Hi-Resolution Images into two great MINI SESSIONS: one at Dolphin Head/Pineland Island, and one at our studio in Hilton Head Plantation. It's just our way of saying, "HAPPY FALL!" But openings are limited. So book early because we reserve only 10 spots for PACKAGE #1, and 10 spots for PACKAGE #2. Don't get closed out. Call our Appointment Desk at 843.342.2774 (Select Option 2) and make your appointment for either Saturday, October 19, or Sunday, October 20. See offer below for more information.